(Bloomberg) -- Algeria’s parliament on Tuesday named the head of its upper house as interim president, potentially placing the country’s tumultuous transition in the hands of a man widely seen as cut from the same cloth as the outgoing Abdelaziz Bouteflika. 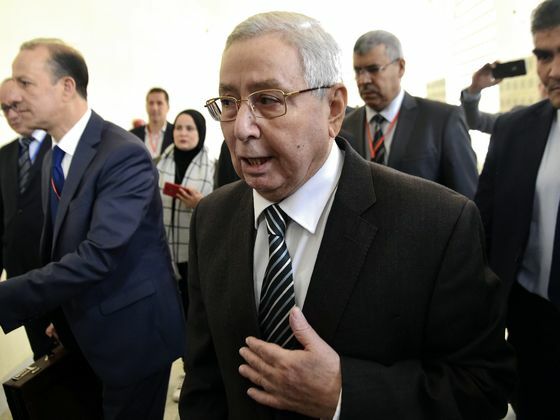 Abdelkader Bensalah’s nomination paves the way for the start of a transitional period after Bouteflika was forced to step down a week ago in the face of mass protests that plunged the OPEC member into its deepest political crisis since a civil war in the 1990s. Algeria’s constitution mandates that power transfer to the Senate head if the president resigns. And while Bensalah’s nomination was widely expected, it is almost as unpalatable to the demonstrators as Bouteflika’s remaining in office. Pan-Arab satellite network Arabiya reported that protests resumed again within minutes of the parliament’s announcement. Bensalah will take over for a period of 90 days, during which officials are supposed to schedule new presidential elections. The backlash against the new interim president suggests that Algeria’s road ahead won’t be smooth. While the protests against Bouteflika, which began on Feb. 22, were initially aimed at ending his 20-year rule, they quickly escalated into an outright rejection of the broader ruling class. The protesters got a major boost when the military’s chief of staff bluntly stated last month that the ailing 82-year-old, rarely seen in public since suffering a stroke in 2013, must either step down or face constitutional measures to remove him from office. But even General Ahmed Gaid Salah is viewed by the demonstrators as part of the ruling establishment, or “le pouvoir” as it’s known in Algeria, an opaque group of wealthy businessmen, military officers and ruling party officials. The new administration must also work to quickly address economic problems that are looming as Algerians focus on the political upheaval. The decline in oil prices in 2014 forced authorities to draw down half of the country’s international reserves to support a generous subsidy system.